Again using a scaled Poser sphere, I place a variant of that same shader to produce spotty gray-green miasma wherever I want. Place whatever color you want in Ambient_Color. 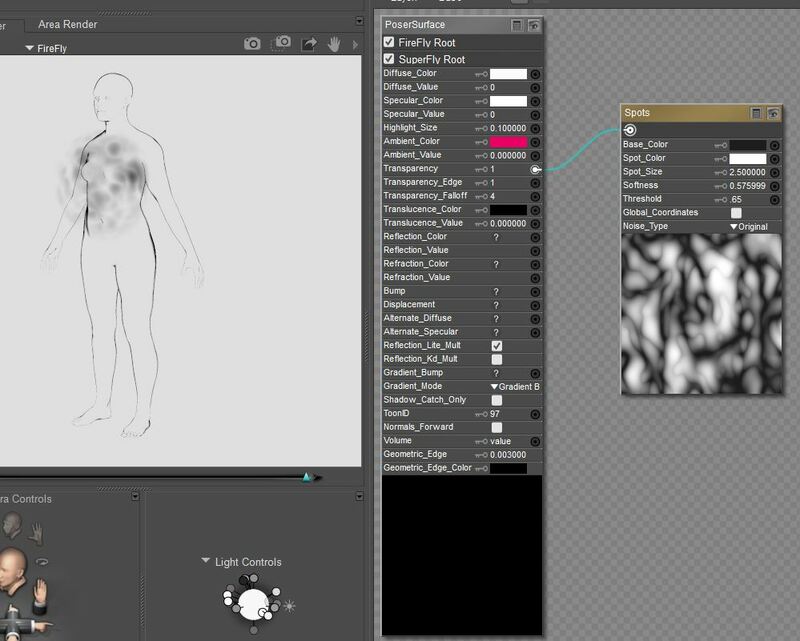 Adjust the parameters in the Spots node to alter the character of the spots. There are lots of effects possible. I'm using the Spots here to control the opacity of the green. Where the Spots node is black, the sphere is invisible. Where the spots node is white, the sphere is Ambient_Color. I'll have to keep in mind that this will need to transform into a thick, cashmere poncho-looking thing, but one thing at a time. Right - and this is where morphing the sphere will be necessary, or perhaps just make the poncho-like object be the shape all along, just change its scale as it animates. I don't have any specific suggestions for modeling such a thing as I generally don't make models by hand. If I make them I use math formulas because that's literally the easiest and fastest way for me. 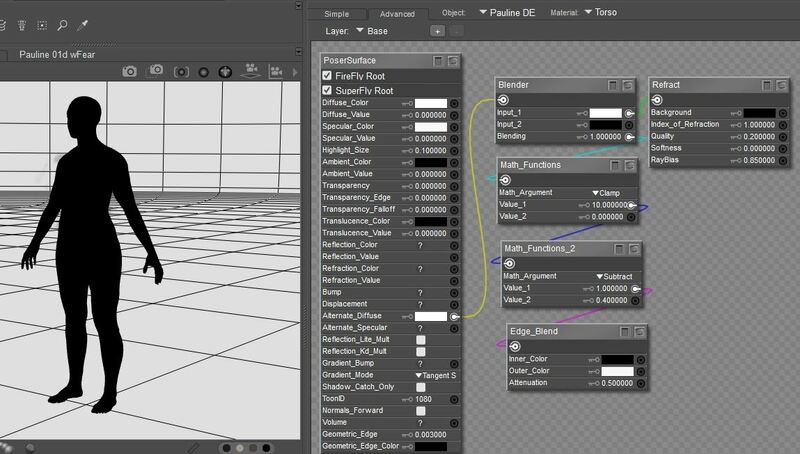 You might try any number of free modeling tools. Blobby things might be easiest in Sculptris. Google it. "If you're new to the world of digital sculpting, Sculptris is the ideal ground on which to get started." @bagginsbill and @seachnasaigh thanks for the tips on removing the horizon. @bagginsbill - Trying out the Spots shader the way you set it up, this is what I get. Any idea, why is the ambient color not showing and it is rendering instead as gray? I think I'll go back and change the figure shader to be more like your Andy there, with less of a harsh edge. @seachnasaigh - I'm looking for this starburst prop and not finding it. Can you share more about where I find that, and what shader you used, (and how the animation happens). I'm revealing how little I know here, and know I need to also dig further into tutorial vids and the manual, so I appreciate your pointing me in a helpful direction even without any further details! Also, for some reason my preview shows the figure as completely black, no contours visible. What might I be doing wrong? Any idea, why is the ambient color not showing and it is rendering instead as gray? Because you have Ambient_Value set to 0 which means turn this off completely. For any pair of parameters xyz_color and xyz_value, the color and value are multiplied together. Note that the value can be more than 1 as well. The final color will be clipped to what your monitor can show, but in-between node color values within the shader can take on any value. The preview renderer does not do raytraced tricks like refraction; so it sees zero diffuse => black. That's to be expected, not an error. If you need to see through him to place lights, props, etc. , you can set the document display style to outline. Full preview shaded mode is the "ball" which looks like a billiard ball. The starburst prop has three pieces (starburst, IDL emitter, aura); hide the emitter unless you want to render Firefly IDL. To hide it, click the "eye" icon in the hierarchy panel. Crud. I don't have sufficient privileges to be able to upload a zip. I'll upload to DropBox and post a link. Starburst material: Instead of an image map node, use a movie node, and load it with the first JPG of a sequentially numbered series. This is the UV mapping template of the starburst mesh; the central junction is at the bottom, and the distal tips of the rays are at the top. The rays are surrounded by a faintly visible "aura"; this is the aura material; it adds two daisy-chained edge_blend nodes which erase the center (tangent near orthogonal) and outer edges (tangent near parallel) to give a soft edge. Holy mackerel, @seachnasaigh ! I'm thankful for this starburst tutorial, have downloaded your zip and will be poking around with it in coming days. And thanks for the tip on preview. Of course it makes sense now. @bagginsbill , here's what I have so far on setting up the smoke/fog in the torso. I think this direction is good enough; it's clear the texture is on the surface of the sphere and not through the center, but it seems to work OK. I'm starting to test out how to make animations while I'm at it, since that will be key to the final product. Thank you both for your help!! FireFly doesn't have volumetric shaders - it only calculates at surfaces, not interiors. SuperFly has volumetric shaders. But I think you would be unhappy using SuperFly - it takes a long time to "converge" on a consistent image and without waiting for that convergence each frame of an animation will have different noise in it from the previous frame. A typical animation render that might take an hour in FireFly is closer to 100 hours in SuperFly. @bagginsbill - OK then. Nice to see I'm bumping up against the edges of what's doable. As long as I know what the limits are, I can work within them to just get stuff done. No way I want my renders to be taking 100 hours! Make a cube. Duplicate it and scatter. Subdivide once to get a roughly spherical shape. This material uses displacement to make the particle surface irregular, and an edge_blend to fade away the exterior edge of each particle. I used frame number to animate the displacement turbulence and the "clouds" driving transparency and color. @seachnasaigh - Sweet! I'll report back when I get a chance to try this out. Some other things demanding my attention for the next couple days, but as soon as I can give this a try I'll let you know how it goes. Thank you! !